Sign Up and have your own personal on line education while you are waiting for the next Workshop ! This Affiliate Service Agreement is made by and between Bullseye Glass Company, (Oregon, USA) and you, as an Affiliate utilizing the bullseyeglass.com service. You must agree to abide by the terms and conditions contained in this agreement in order to participate. Please read this agreement carefully before registering and using the service as an Affiliate. By signing up, you indicate your acceptance of this agreement and its terms and conditions. If you do not accept this agreement, do not sign up as an Affiliate. 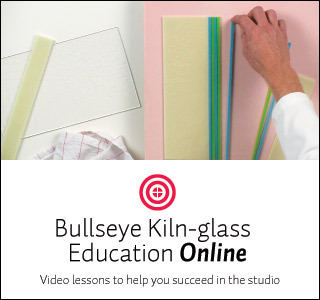 The following agreement is summarized as follows: • You may place banners or links to Bullseye Kiln-glass Education Online within your newsletters, in content of your website, or within your other web-related content. • You will be paid your commissions on a quarterly basis. • Automatic payment will not be made until the accrued commissions exceed $25. • All statistics are collected and calculated by Bullseye Glass Company, and will be the only valid stats used for determining commissions. • As an Affiliate, you can only have one (1) account. • You cannot refer yourself as a student to Bullseye Kiln-glass Education Online and receive a commission. (Sorry.) • You cannot hold Bullseye Glass liable for anything. A link to a non-bullseyeglass.com website does not mean that bullseyeglass.com endorses or accepts any responsibility for the content or the use of such website. • You cannot SPAM. We will terminate your account on the first offense of spamming. Do not send email to lists or groups that you do not have permission to send to. • Affiliate accounts that are left inactive will be removed from our system. An abandoned affiliate account is defined as any account that has not been logged in to for a period of 6 months or had any transactions posted to that account. If one or the other of those conditions is true - the account will remain in an active state. • NOT ALLOWED: All other uses of Bullseye banners or links, such as newsgroups, chat rooms, ICQ, message boards, banner networks, hit farms, counters, or guestbooks etc. are NOT allowed. • NOT ALLOWED: Any placement of creative in a "Desktop" advertising scheme. This includes any and all 3rd party advertising platforms that use a desktop application to display ads in any form. • NOT ALLOWED: Any display of a merchant window that isn't the result of a direct click by the end-user. • Failure to abide by these rules could mean termination of your contract with a complete forfeit of commissions. • Fraud is a serious offense, and will be treated as such. Fraud is defined as any action that intentionally attempts to create sales, leads, or click-throughs using robots, frames, iframes, scripts, or manually "refreshing" of pages, for the sole purpose of creating commissions. Any attempted fraud or fraud will result in membership termination and voided commissions.